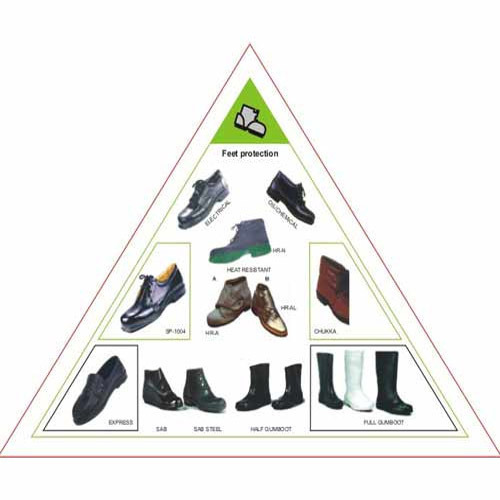 Our company provides different types of safety shoes to safeguard the customers’ foot. The industrial Foot Protection Shoes supplied by us are ideal to protect your employees’ foot from any kind of injury due to falling or rolling objects or objects piercing the sole and where such employee's feet are exposed to electrical hazards. Our organization is backed by a sound experience of 3 decades, which helps us in gathering a huge client base across the market. We are engaged in manufacturing, exporting and supplying a wide range of Personal Protective Equipment to our clients. Our range of products includes an array of PVC Apron With sleeves, Blended Kevlar, Rubber Apron, Boiler Suit, Asbestos Suit. We also provide Bocal Goggles, Flex Seal Goggles, Chrome Canvas Gloves and Chrome Split Leather. In our manufacturing process, we use optimum quality raw material, which is procured from the most trusted and reliable vendors of the market. Besides, we offer customized solutions for our clients as per the specifications detailed by them. Different modes of payment are accepted by our organization like cash, cheque and online transfers, for the convenience of our valued clients. Moreover, we offer packaging solutions to our clients so as to ensure a safe transit of products from our unit at clients' desired place.